This was a last minute decision: do a test ride before starting my tour south from Banff. There is new equipment to test: a new trailer, an almost totally new bicycle build, including frame (so, essentially, an almost totally new ride), new tubeless tyres… And I’ve never cooked on tour before, preferring restaurants where available (India, Spain, France) or cold snacks. And a test ride would get a start on building fitness after a year in front of the computer, gaining weight. First consideration was the new first section of the Great Divide Mountain Bike Route (GDMBR) which starts in Jasper, heads north-east to Hinton before following the mainly gravel Forestry Trunk Road south and somewhat east until level with Banff, then following the Highway 1A (scenic, popular with visitors, narrow and winding with no shoulders, too many serious accidents over the years) about 125 km back west to Banff. 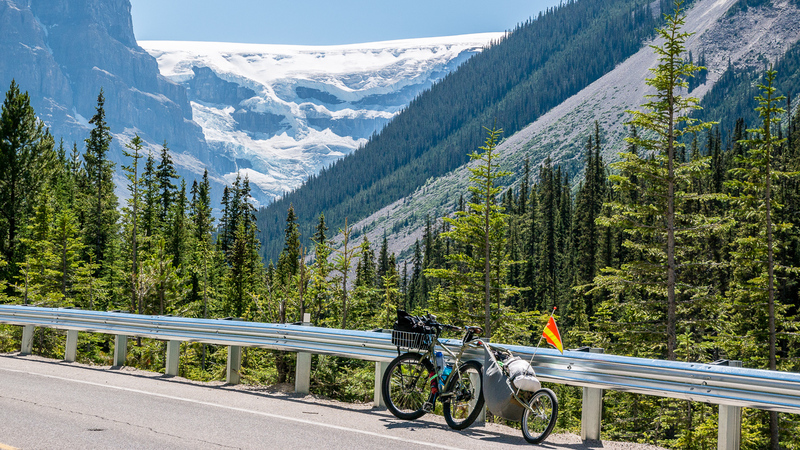 Second consideration was the world-famous Jasper – Banff Icefields Parkway with spectacular mountain scenery, pavement, good shoulders virtually the whole way, and a couple of hundred km shorter. I chose views and pavement over gravel and forest. Thursday 12th July – Saturday 14th July, 2018. Jasper. After a mid-afternoon start (still getting bike stuff together…), we stopped for a snack at the deli in Lake Louise. 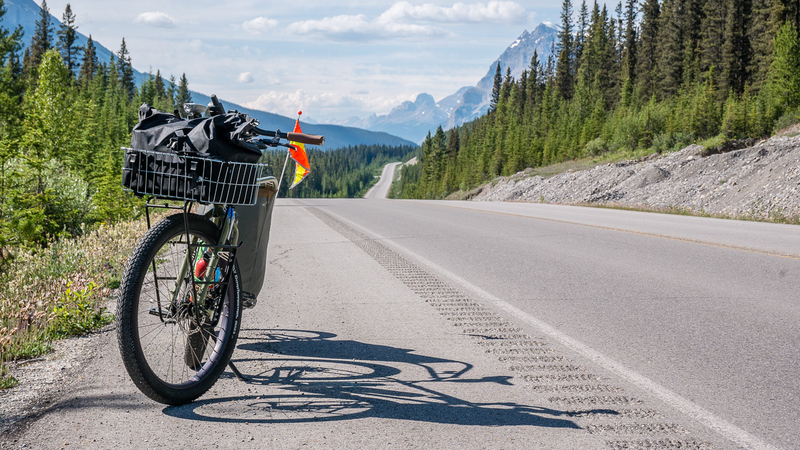 And chatted to a couple of bikepackers who were on their sixth day of hard riding, having started in the Crows Nest area, raced the Alberta Rockies 700 up the gravel Forestry Trunk Road to Hinton (north-east of Jasper) and then on pavement down the Icefields Parkway (240km/day on the FTR, a relaxing 160km/day afterwards). Pretty impressive in a masochistic fashion. We continued our drive to Jasper, me somewhat subdued by the hills I would encounter on the bike, and arrived at our campsite immediately south of Jasper as it was getting dark. It was great to be back in the tent with Bev, the first time this year; it brought back fond memories of previous cycle-touring summers. Next morning, we started by looking for a campsite for the evening. This was not an easy task on a Friday in high season but we eventually found a walk-in site at Snaring River CG, about 20 km from Jasper. Not a great weather day so went for brunch in town, wandered around and met Baptiste Godet. Bat was on a bike, French but had ridden from Fairbanks and was on his way to Argentina. 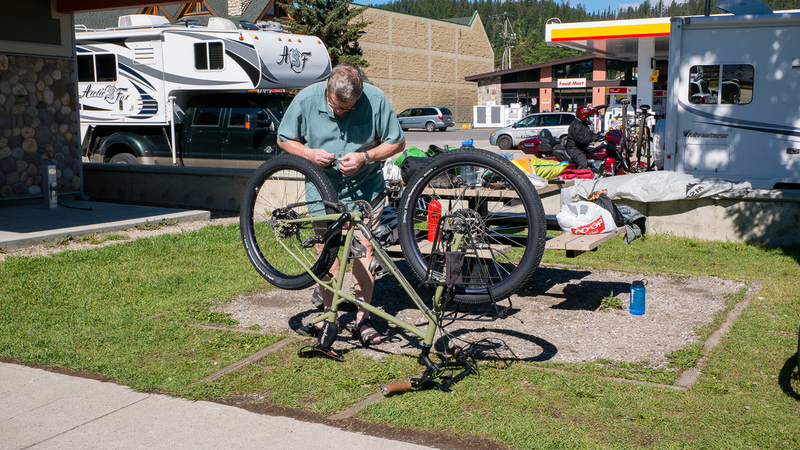 He was planning on going down the Tour Divide (also known as the Great Divide Mountain Bike Route, GDMBR) after spending some time in Canmore. 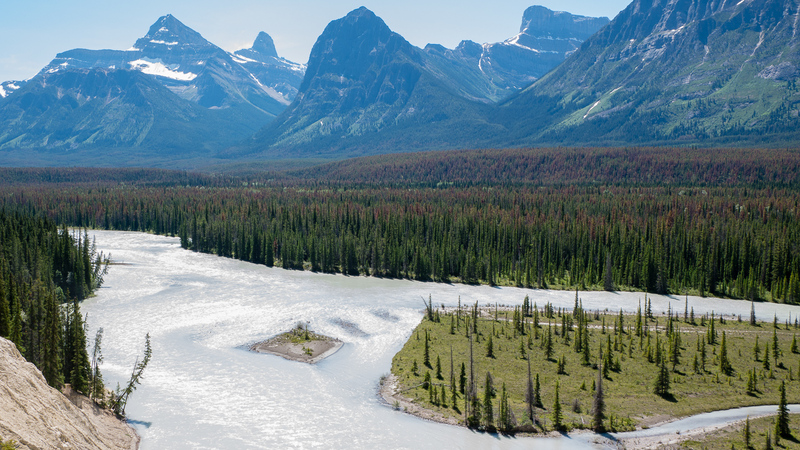 He had a contact in Canmore, a man about my age, who had done the Divide recently. I wondered if it was J.D. (Jean Daniel Recompsat), someone I worked with in construction a couple or more decades ago; he’s the only one I know from Canmore who has done the route. Bat and I agreed to stay in touch, although I suspect I’d be hard pressed to manage half his pace. There was time for some tourism; Bev and I went out to Maligne Canyon, arriving at the same time as a coachload of Chinese tourists. They were all wielding umbrellas against the light rain, and safety glasses would have been valuable on the trail. 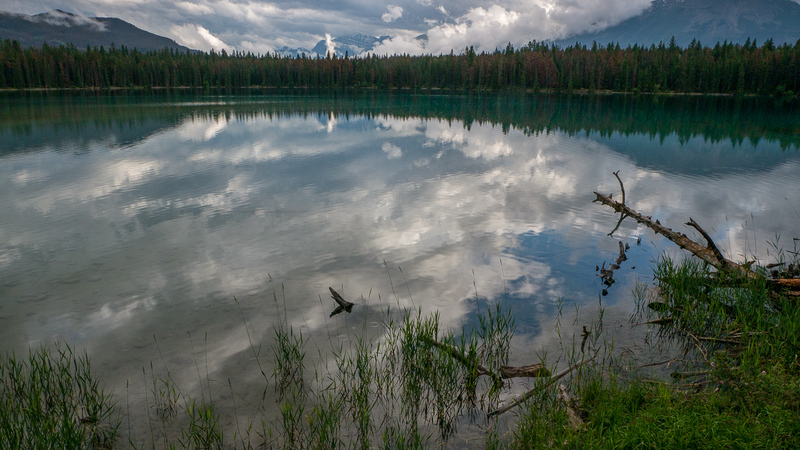 Later, we stopped at the very pretty Annette Lake for a photo opportunity before returning to Jasper for a wrap in a spicy-Jamaican café and retiring for the night. Annette Lake. 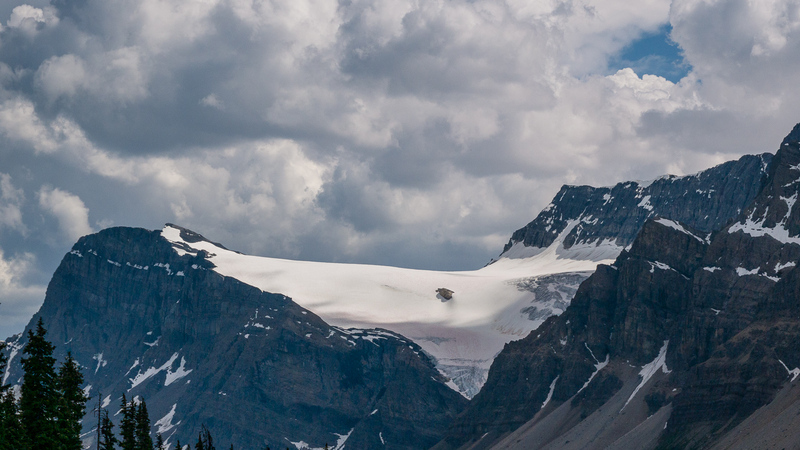 The mountain just right of centre with its summit in the clouds is Mount Edith Cavell. 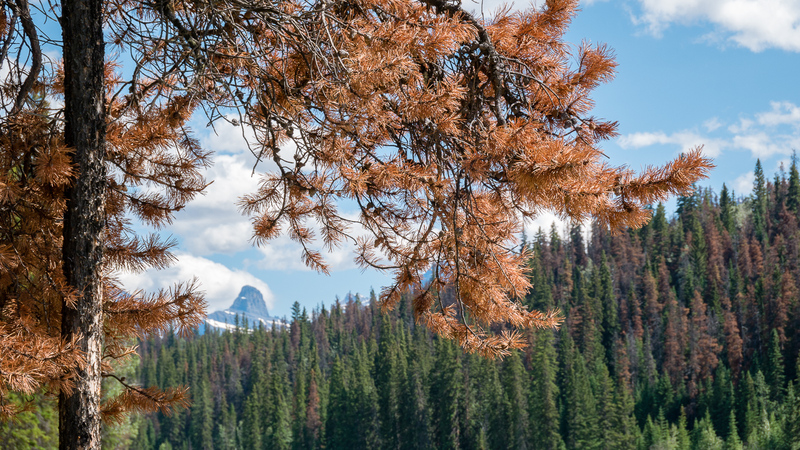 The brown, dead, pine trees have been attacked by Pine Beetles. 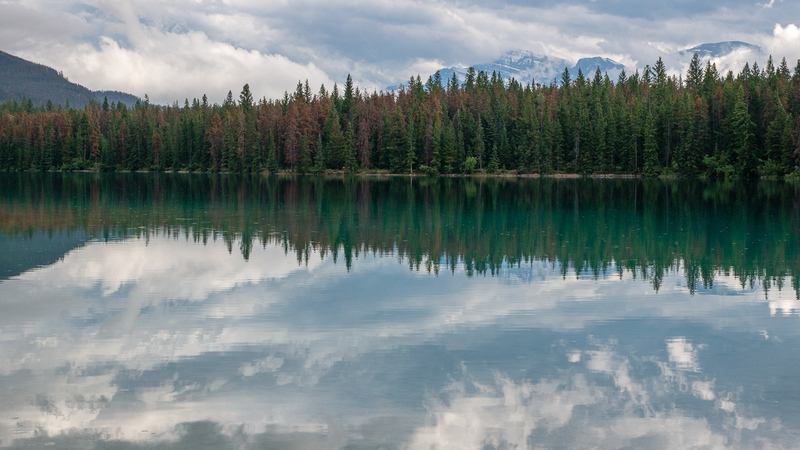 The Parks Canada policy is to let them naturally be replaced by new, young trees that are not targeted by the beetles. We parked downtown Jasper in the morning and started putting everything together. The trailer-halves mated easily with a little grease, the new tubeless wheels seemed to be both holding air and rotating freely without any brake adjustment, and everything except the food fit in my duffel bag. After a quick late lunch, I set out on the ride at about 2:30pm. A hot (high 20s) afternoon to try out riding with a load in the trailer for the first time. But I was finally on my way. I was aware of the trailer immediately. My two-wheel trailer handles differently; I don’t even know it’s there until I start to climb or to brake. In contrast, I definitely know I’m pulling the one-wheeled Farfarer. But my two-wheeler won’t work for what I have in mind: steep gravel and double track forest trails. The two-wheeler (a Cyclone IV by Radical Designs) is balanced across the axle which results in very little weight being applied to the rear wheel of the bike. On steep gravel, I am pulling quite a load with no extra weight on my rear wheel so that wheel has a tendency to spin out. Also, on double track trail, I ride down one of the two trails created by the wheels of a motorized vehicle and my two-wheel trailer wheels would bounce along in the rocks and grass on either side of the trail, increasing resistance; not a good solution. 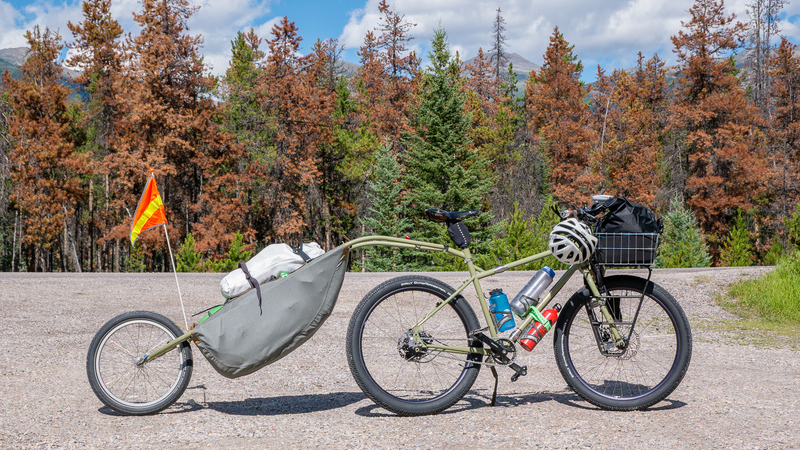 Alternatively, the one-wheel trailer transfers more weight to the rear wheel, and tends to follow the trail I am riding along. I haven’t been on steep gravel yet so I’ll have to see how much traction is improved! Minor mechanical issues had me halted for an hour and a half. First, I noticed my chain had tightened; a quick but necessary fix since it does make pedaling harder and probably puts the rear axle-bearing under unnecessary strain. But I also noticed that I was only getting 13 of my 14 gears from my Rohloff internal hub gearing – this is a little more serious. I suspect the problem is a recent cable change I made. If I disconnect the cables, all 14 gears are there; I adjusted the gearing so that I had the bottom gear (which will be put to much use!) at the expense of the top, 14th, gear. So, I won’t be able to speed along the flats – but that was probably never going to happen anyway. My cycle computer seems to be incompatible with the basket on my front rack. The signal between the wheel and the computer on my handlebars is blocked: sometimes there is no signal, some times the readout jumps from low speed to high speed. Fortunately, I have a Garmin GPS on my handlebars, too. I will have to rely on that. Bev very kindly drove to the next two campgrounds and returned to tell me that they were both full. Then turned around again for her six-hour drive back to Calgary. What an angel! I continued, not fully appreciating the spectacular views, head down, sweating. Tours always start out this way for me; I’ll be fitter and lighter in a couple of months. With the sun lowering in the sky, I kept my eyes open for wild camping sites, out of view of the road and any park rangers, but the brush on each side of the road was pretty thick. I explored a pullout for a lake where a truck and trailer was parked up. The family donated two ice-cold bottles of water (they offered cold beer first but I was certainly a little dehydrated for alcohol) which disappeared quickly. They finished up their barbecue and drove on while I searched for somewhere to sleep. I found a place, fairly flat, just big enough for my tent and hung my food from a tree about 25 m away. There was even cell-service so I called Bev, who had just arrived home. The call was a bit phrenetic; I was dancing around swatting mosquitoes which, with the sun down, were out in force. I said a quick “Good night” to Bev and ran for the safety of the tent. 29.18 km. 311m of ascent. Moving average 9.5 km/h. At least, with time, those figures will improve. And a loud “Happy Birthday, Mum” to my newly 86-years-old mother in London, UK. I had a quick stop to replenish my water supplies at Kerskelin CG, the campground that I would have stayed at if there had been space. 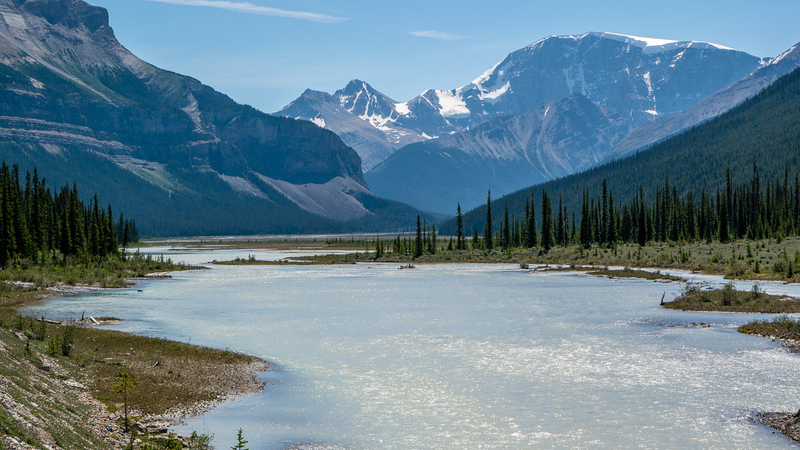 I walked down to the Athabasca River and had a rub down to freshen up a little. 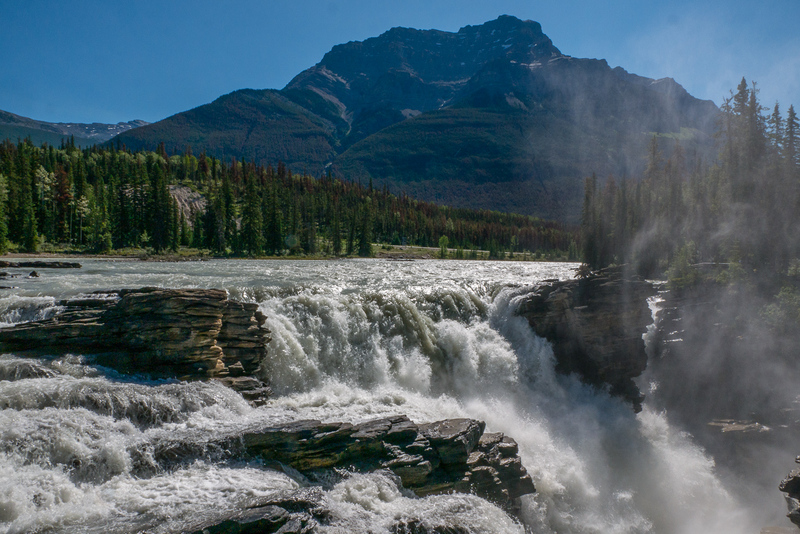 I briefly stopped at one of the many attractions along this route: Athabasca Falls. A little further on, cars were parked at the side of the road, and on the road, to view some goats grazing along the verges. The cars parked actually on the road, a danger to passing traffic, were perhaps 25 m from a large, paved parking lot next to a viewpoint. The second crowd of parked cars had halted to photograph a bear eating berries a few metres from the road. Blithely unconcerned about potential danger, crowds clicked away. My plan was to go as far as Honeymoon CG, which I (mistakenly) thought was about 40 km on from Kerskelin CG. I was passed by three Quebecoise ladies on road bikes, also going to Honeymoon Lake CG. They would be there before me so I gave them the cash for a site to reserve in my name. Not very much farther on, at the top of a long hill that I was happy to walk, was Honeymoon Lake CG. Much closer than anticipated. There was a “Full – Complet” sign outside the entrance but there were still plenty of empty sites. And a site with my name on it. It was an earlier stop than I had anticipated, 3.00 pm, but fate had conspired against a longer day. Not that I really minded. 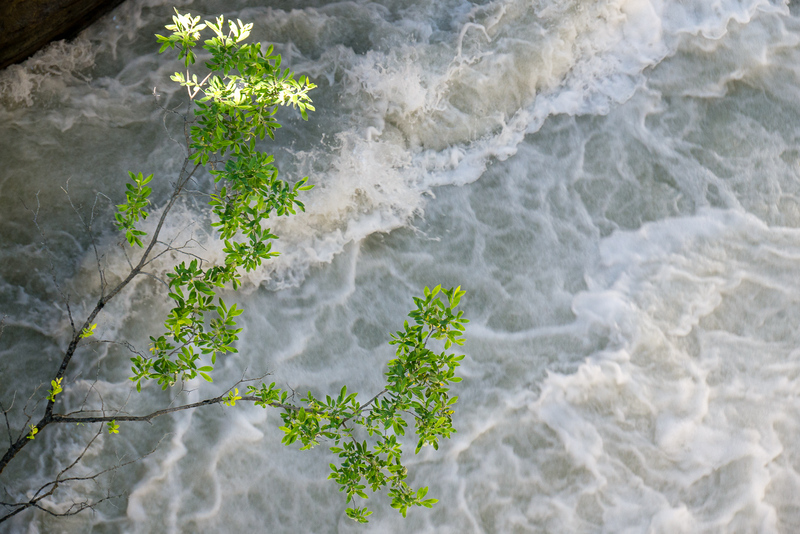 In underwear, salt-stained shirt and sandals, I waded into the lake. And was attacked by a school of small fish, nipping at my calves. Very strange indeed. Another step and my foot sank up to my knee in soft mud and I was suddenly chest-deep in water. Another lurch and I lost the other leg. I turned towards more solid footing, carefully lifting my feet out of the mud without leaving my sandals buried in slime. Fortunately, Chacos float! By the time I reached the shore, I was dirtier than when I had entered the lake! Cooked pasta with tomato source (a Sidekicks package), with a tin of sardines stirred in. Very good, especially since I hadn’t eaten much all day. My new stove seems to work well. Three Quebecoise cyclists on one side of me, a Dutch couple, on full-suspension mountain bikes, on the other. Another cyclist, Steve Tober came by for a chat later on. He was riding a tandem with his 9-year old daughter, and his 11-year old son on a road bike while his wife drove the sag (support) wagon. 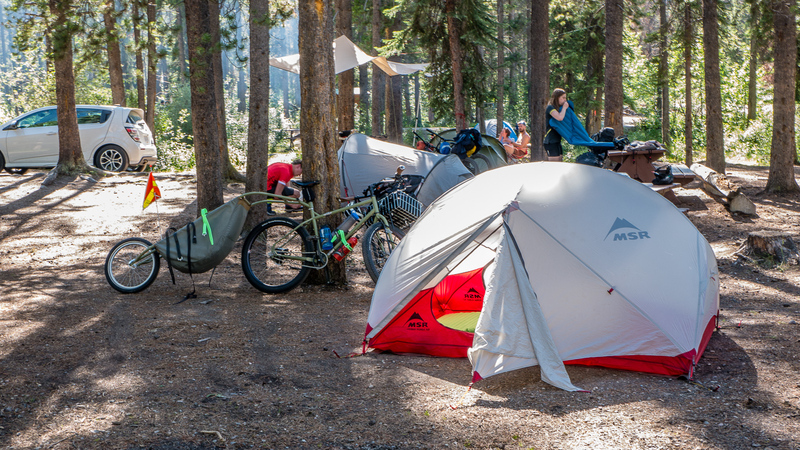 They’d set up at one campsite and use it for a base for a couple of days: drive in to Jasper, then ride the first day back to camp, ride the next day from camp to the next logical break, drive back to camp. Seems a great system for a young family. Steve has strong cycle-touring credentials: Tijuana (Mexico) to Santiago (Chile), spread over several summer vacations from his job as an elementary teacher; a 4000 km trip around Lake Victoria in Africa when his application for an Indian visa was turned down because he was teaching in Libya at the time; rode the length of the Amazon when it was still gravel. He also taught in Quito (Ecuador) and, as a Warm Showers host, hosted Cass Gilbert when he passed through on one of his trips. More about his adventures at https://tober-zambrano.blogspot.com; well worth a visit! The world is full of cyclists doing amazing stuff! 25.13 km, ascent 313 m, elevation 1400 m.
Monday 16th July, 2018. Ice-tents CG. I was the first out of camp but not in front for long. My legs felt tired but not painful. No issues with my knees, a normal problem at the beginning of the season; the anti-inflammatory I had been taking seemed to be paying off. (Seriously, this getting-old business is always what it is cracked up to be). The earlyish (8:30 am) was a good thing; it was going to get hot (with 33C forecast in Jasper). I stopped at noon for lunch at Jonas CG, quiet and deserted, quite beautiful, at this day. Coincidentally, Steve showed up, also stopping for lunch on he and his family’s ride down from Wilcox CG, Carla calmly sitting on the rear seat of the tandem, chewing away on an apple. More chatter: Steve taught for a while at Dalhousie Elementary, my wife is an educational assistant at West Dalhousie Elementary. The afternoon turned brutal; hot, with headwinds. I was down to second gear on the flat, and there wasn’t too much of that. Interminable uphill, about 10%, that had me pushing hard (literally; no riding on this stretch). I drank water and pushed for a hundred metres, drank water and repeated. Crowded with lines of people waiting to get on to the Brewster Glacier Skywalk – a little bit of engineered walkway out over the mountainside with a glass bottom. Selfie sticks are back in fashion. Maybe they never went away. Some downhill, more flats with stronger headwinds blowing off the Columbia Icefields. Walking was easier. Then a long climb up to Columbia Lodge (pushing again, pushing still) although this was not so brutal. Above the glacier now, I had a bit of a tailwind. Continued to the Ice-Tents CG (a bit of a misnomer; just a campground near the Icefields that did not accommodate travel trailers or RVs. My three Quebecoise friends had arranged a site for me, having started a few hours later than me and finishing 2.5 hours earlier. My off-the-couch body seems to be finding each day a little harder and I was staggering around the site, getting set up. Clearly, the heat and the sun had had an effect upon me, as well as the hills. First thing I did was to boil water for numerous cups of double-spice chai, tea with a little more character. A small packet of Channa Masala made a small but tasty dinner. With wine gums for dessert. And more chai. I’m not quite sure what tomorrow will bring. The days starts with a little uphill, some considerable descent followed by an ascent to Waterfowl CG. I’m wondering whether a rest day is in order… But a rest day a Waterfowl might be better, before the long hill up to Bow Summit. Distance 54.13 km. Elevation 2028 m. Ascent 844 m. Moving average? I don’t want to talk about it. 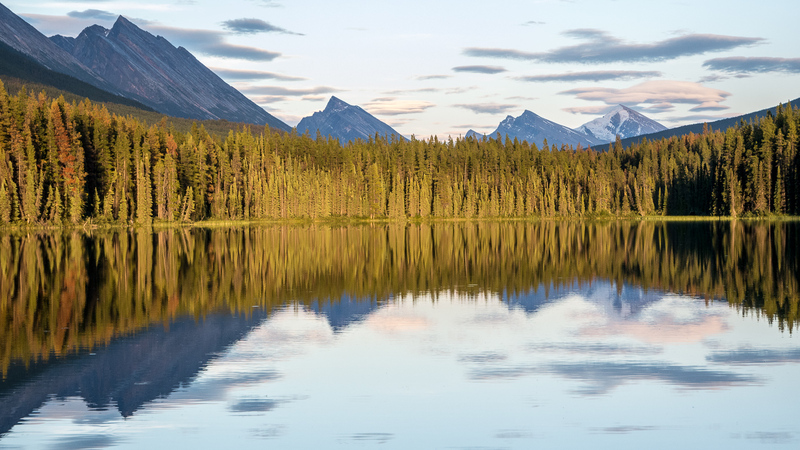 Thursday 17th July, 2018 Waterfowl Lake CG. Bit of a climb to start followed by serious downhill. I made good time to start despite my tiredness from the previous days’ exertions. Then rolling terrain, another hot day. More spectacular scenery, largely underappreciated as I pressed on. Quite a lot of road traffic. Any other cyclists I saw were going the other way or passing me. My steel frame, big tyres and trailer aren’t going to win me any prizes except, perhaps, for stubbornness. A kind motorists stopped to donate iced-water. Much appreciated despite an unnecessary admonition from the driver to dispose of the bottle appropriately. Grateful for the cold drink, I didn’t mention that the plastic bottle was itself inappropriate. Another driver with a family stopped, too, and provided cold water and iced-tea. These random acts of generosity did wonders for my mood in the hot afternoon. The Crossing! At Saskatchewan River Crossing, highway 11 (the David Thompson Highway) heads east from the Icefields Parkway to central Alberta. At the junction of the two roads lies The Crossing – a complex offering accommodation and food at inflated tourist prices. I bit the bullet, and took out my wallet for a lunch of tomato vegetable soup, a house salad and a fruit bowl. And a welcome, hour-long break from the heat, shared with Warren and Brenda, two cyclists about my age from Saskatchewan. About 25 years ago, I spent some time at The Crossing: a friend had a contract to build staff housing there and I had a sub-contract to do the cedar siding on the exterior of the building. A very strange and somewhat unsavoury place. I was there for a few weeks (with frequent trips back to Canmore, where we lived at the time, to regain perspective and enjoy the cleansing company of my wife). Off-season, the place had a ghostly feel as I worked alone into the dark most days. Food was provided for the skeleton staff but we were never quite sure what we were eating. I was warned to lock my door at night since one member of domestic staff was known to wake up sleeping colleagues by performing an uninvited sexual act on them. Meanwhile, the owners spent their evenings in the large, largely empty, bar watching inappropriate x-rated content via their satellite dish on a large screen. When I finished my contract, I never for a moment ever contemplated returning. I pulled into Waterfowl Lake CG at about 6:00 pm. A huge campground and it took a while to find the ‘girls’ and my site. The cumulative riding days are having an effect and I will have a rest day tomorrow before tackling the ride up to Bow Summit. Some rain in the night. Distance 70.1 km. Ascent 579 m. Elevation 1670 m. Moving avg 10.6 km/h. Fully intending to have a rest day, I was still in my tent by the time the ‘girls’ left. It wasn’t a particularly stunning day, overcast, and after a couple of hours I decided I may as well press on. Yes, there is a big climb up to Bow Summit but I can at least make some progress. I rode gently on tired legs out of the campground at 12:30 pm. Immediately uphill but rideable to start. When it steepened, it was pushable. I was passed by several cyclists on road bikes, without loads, who were not actually sprinting up this hill. It was a long push to the summit, reached about 4:00 pm. I was joined briefly by the couple from Holland whom I’d met at Honeymoon Lake a couple of days ago (I’ve no idea how managed to get behind me!) 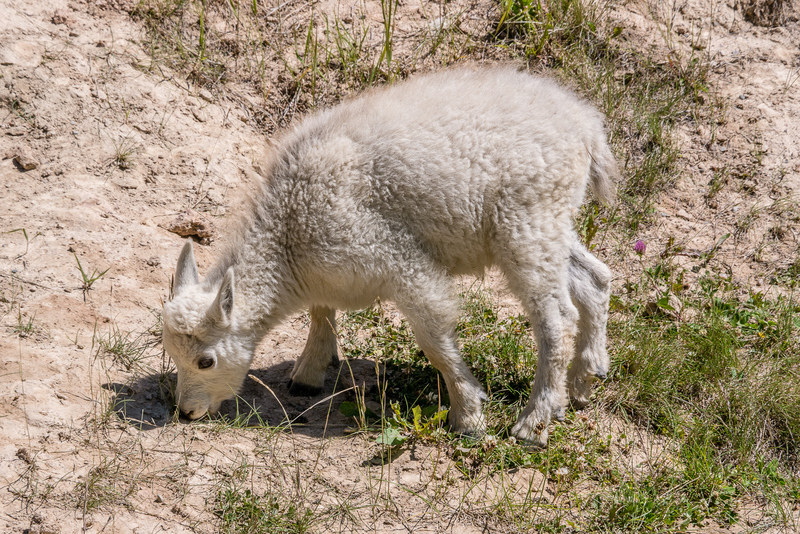 but they decided to continue further uphill to the Bow Summit viewpoint. I was disinclined to follow them and settled for a cliff bar and then a coast downhill towards Mosquito Creek CG. The campground looked inviting but it was only about 20 km to Lake Louise… Mainly downhill so the distance disappeared relatively easily. In Lake Louise, I headed to the Hostel; seven days out from Calgary, I could really use a shower. They had a bed in a dorm, which posed a bit of a dilemma for me. The Lake Louise CG would undoubtedly be full and the overflow camping area was just for RVs with no tenting. The hostel has a good restaurant and I wolfed down a large spicy burger and even had room for some dessert. Draught IPA was on the menu but not actually available so I had a couple of pints of iced-tea. Then I showered and sorted my gear in the dorm. Back down at the front desk, I collected 5 pair of ear-plugs for my fellow dorm occupants. Sitting outside were my three ladies from Quebec who were surprised to see me, and laughed at the sight of the earplugs. A story came out: one of the ladies had been frightened the previous night by a noise she presumed was the roaring of a bear. But the noise was coming from my tent in the next site. And she had been wearing earplugs. Thursday 19th July, 2018. Lake Louise to Banff. I woke early in the dorm room as it was beginning to get light. Very much too early to get up, even if I were an early bird. I dozed until around 7:00 am and then went down for breakfast, looking forward to something more interesting than my recent bowls of granola. A burrito with home-fries and lots of hot sauce did the trick. A pleasant change, indeed. None of my dorm-mates said anything to me in the morning. I’m not sure whether that is a good or a bad sign. But, somehow, it was noon before I had consumed four pints of iced-tea, packed my rig and was rolling away from the hostel. 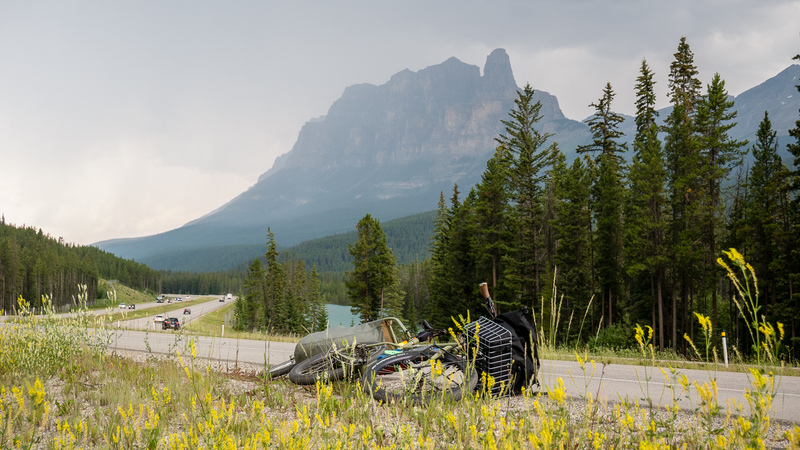 A couple of German cyclists was paused at the base of the hill up to Lake Louise ski resort and the turn onto the Bow Valley Parkway. They had pannier-laden bikes and a trailer containing a small baby, fast asleep. The couple had just been informed that the Parkway was closed after about 12 km but were puzzled by the occasional vehicle coming down the road from the direction of the closure. I explained that this traffic was probably going to the ski hill (there is most likely a summer gondola ride to hoover up spare tourist dollars) and wasn’t necessarily an indication that there was through traffic on the Parkway. I turned around and headed back to the busy Trans-Canada Highway while the Germans dug out their helmets. It was only a few metres back to the highway access road and it didn’t take long to be riding along the smooth wide shoulder, trying to ignore the steady stream of traffic racing past on my left. I thought I was making reasonable progress when the German family cruised past me. Damn, Dave, get over it! You’re off the couch, overweight and old! It doesn’t matter. Otto, a Kiwi now resident in London, caught me a while after and we chatted as we rode along. He had a light-ish load but planned to make it as far as Radium which was not a trivial objective. Otto had ridden from Anchorage to Fairbanks, Alaska, before coming down to Canada on his way further south. Not all the way to Argentina; he has to be back at work for November. He had an unrepeatable take on Prince George but the gist of his description was that it wasn’t worth a visit. Apparently, it does even warrant an entry in the Lonely Planet guides. It didn’t sound like great riding, either: busy with traffic, every other vehicle a large truck, every other large truck an extra-wide truck that came too close for comfort, and no shoulders on the road. Bad surface, too. Apart from that, he was very positive about his ride. We parted company at Castle Mountain junction, just as the weather turned bad. Heavy rain for a while, a little hail, and impressive lightning strikes on the peaks of Castle Mountain. Fortunately, the rain eased after 15 minutes and I managed to keep fairly dry. A continuous flow of traffic so thank goodness for the shoulders. Close to Banff, there was a cycle path a few metres from the highway and I crossed the grass to pick up this alternative. But for only a short distance; this path followed the natural contours of the land more closely than the engineered highway and, facing a steep descent followed by a steep ascent to get back to highway level, I steered back to the highway shoulder. 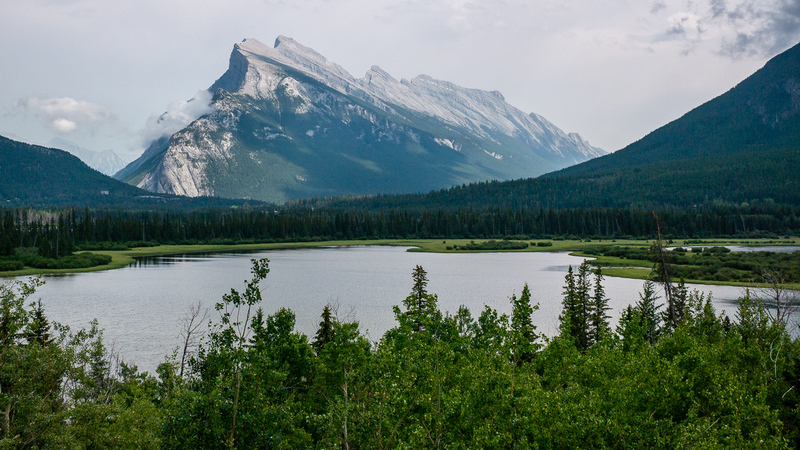 The distinctive outline of Mount Rundle came into view, signalling the approach to Banff. A million photographs have been taken from this spot, most with better light than this one. The valley to the right of the mountain is where I did my first ever mountain bike trail ride. I’ll be heading back up this valley in a couple of weeks on the first day of my Great Divide ride. I met Bev at the first entrance into Banff, loaded the rig into the back of her Outback, and was driven in comfort back home to Calgary. Time for a quick shower and change, then out to dinner to celebrate my father-in-law’s 88th birthday. Training/shakeout ride over. Lessons learned, adjustments to make. I’m in Calgary, unfortunately. I went back on the route but was too stressed and not mentally ready. I could handle the physicality (slow to start but that was expected) but couldn’t eat and wasn’t having fun. I need to do more preparation with the added complication of carrying food and water. I am disappointed with myself but recognize it was probably the correct decision. It’s still on the bucket list. Bev still has her plane ticket to meet me in the Baja for Christmas. I’m leaving in my truck next week allowing me five weeks for a leisurely week’s drive. When I get somewhere warm, I’ll do some riding, 2-4 day mini-tours, continuing to work out my systems. I’m not sure when I’ll be back; I have a course starting at the end of January but I can ‘attend’ that anywhere with a good Internet connection.